Tim Mee Toys is an American toy company that makes “processed plastic” toys. They’re best known for their theme based bags of figures that ranged from clowns to farm animals to toy soldiers. But the bags that I had and loved as a kid were a line of Star Wars themed 2″ figures that played along with my Micronauts and Star Wars toys. There was an R2-D2 inspired droid in particular that saw lots of action on my playsets and my Micropolis MegaCity. The toys came in a variety of bars and packages. 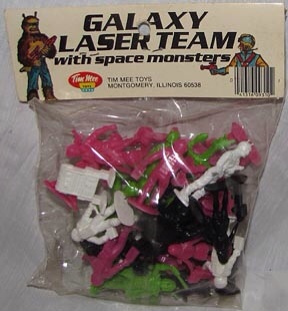 Santa gave me the Galaxy Laser Team in my stocking, but the figures were also known as Star Patrol and Linea Cometa. All together, there were 8 types of figures (I believe) and 2 star craft as part of the line. Shown below are all the figures, but I still need to obtain and photograph the star craft. Check out the detail on these little fellas. The “wookie” is downright awesome. Photos by my friend Ally Kat. The gray ‘Henchman’ in the middle is actually from Accoutrements ‘Spacemen vs. Alien’ set, but he does seem to fit right in. I worked with the current owners of the Tim Mee brand to reissue the GLT last year, and we also have a facebook page for them. Doh! I will have to excise that figure then. Not familiar with the line you mentioned. Vintage or new? The Accoutrements set was fairly recent, but appears to be discontinued now. Is there any way of getting these great space soldiers in Europe… I’ve been looking everywhere and would love to have some of these alien figures in my toys collection. Please help me out. Loved these as a kid….any chance the current owners of Timmee will re- issue the larger spacecraft, space helmet, or laser guns that went along with this set? Those were cool as well. It will depend upon if the tooling is available and if there seems to be enough demand to warrant a productions run. We commissioned 2 new sets of the GLT figures, Bright Green vs. Blue and Red vs Orange. If they’re popular enough over the next couple of months we’ll look into the larger X-Wing Rocket. The flashlight guns will be more difficult to get back into production, but it seems that at least the rifle version tooling is still around. The new colors should be available on Amazon and VictoryBuy.com by Monday, November 11th. Just wanted to pop in and say that the reissued Galaxy Laser Team sets that Jeff mentioned (50 pieces!) are now available in several new colors on Amazon. The sets average about $12–that’s a pretty awesome price! Just wanted to post an update you might find interesting. 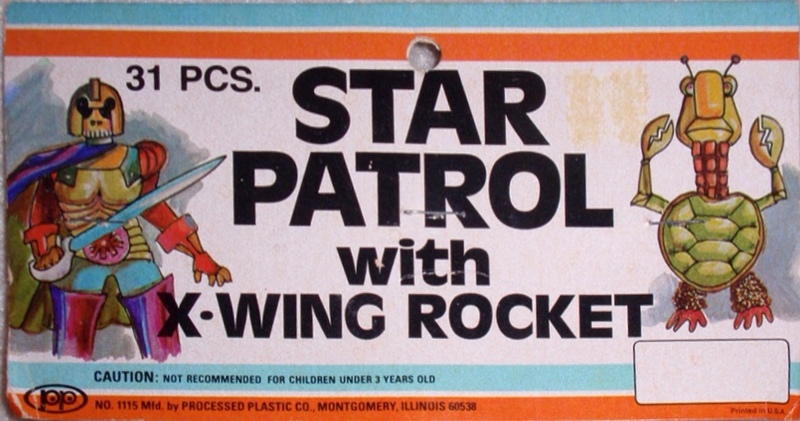 Tim Mee/Processed Plastic also released some of the space figures in ‘jumbo’ 4.75 inch size, usually branded as ‘Star Patrol’. They only made them for a couple of years and it has long been thought that the molds were shipped to Mexico and were no longer in the US, but the factory found the tooling this past summer and we were able to get a reissue made in time for the holidays. I had some of those! Lost them years ago of course. I’ll have to pick some up. How did you know about the history of the molds? Or is it on the website and I’m a moron for not looking?